Last Spring I finally beat the Wood Pigeons to harvesting our delicious Loquat fruit so I made jam, following the same recipe I use for Plum Jam. 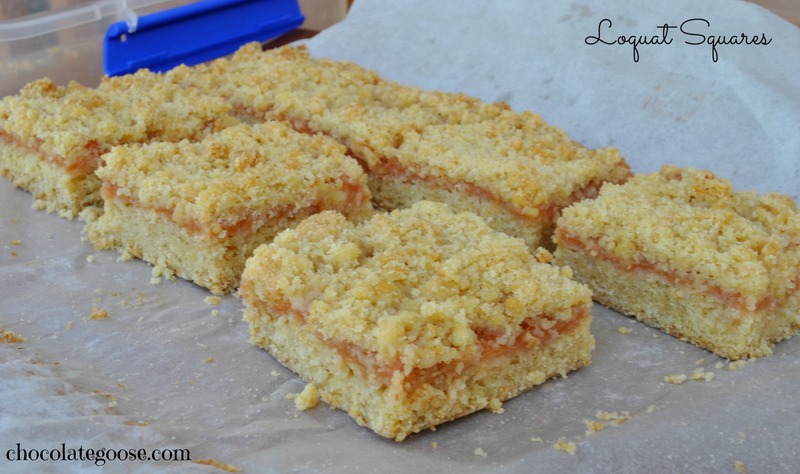 Then, using the Loquat jam, I made these delicious squares. The original recipe called for apricot jam, but any jam will do. They’re an easy and delicious snack. I can’t believe we’re already almost midway through January, but December seemed to literally fly by. You know how it goes; the countdown to Christmas, the end of our school year, trying to get everything finished at work if you’re lucky enough to have a few weeks holiday and then suddenly you are on leave. It always takes me about a week to slow down and enjoy the time I have at home as there seem to be so many things to catch up on, but this year we didn’t go away, we’ve just been at home enjoying the company of our guest, our home and family time together. Adding sweet treats like these is delightful to the taste buds, but I can feel the extra few centimetres around the hips and waist line, so soon it will be time to climb back on the treadmill so to speak and loose some of the unwanted excess. This recipe is taken from one of my original recipe books bought a million years ago titled The Snowflake Book of Baking and as I mentioned, is interchangeable with any jam, whether home made or store bought. Preheat the oven to 180°C (350°F) and line a 20 cm x 24 cm rectangular tin with baking paper. Beat the butter and sugar well. Add the egg and essence and beat until light and fluffy. Sift the cake flour and baking powder and then add to the egg mixture. Knead well. Press about half the dough into the tin, covering the base evenly, then spread the jam over the top. Coarsely grate or crumble the remaining dough over the jam. Bake in the oven for 20 minutes or until golden brown. Remove from the oven and leave to cool for a few minutes before cutting into squares. Leave in the pan until completely cooled. Remove from the pan by lifting the baking paper. Dust with icing sugar. They stay fresh in an air-tight container in the fridge for up to a week but seldom last that long.